My apologies for the delay of this post! Life has been absolutely crazy for us, but we’re back to blogging. I can’t believe it’s been exactly one month today since Tout Sweet had their official grand opening. We were so excited when we heard that Yigit Pura of Top Chef: Just Desserts was finally opening up his dream bakery in his hometown of San Francisco the weekend after Labor Day — the same weekend we were planning to be in SF for the Late Night Alumni show at Ruby Skye and the Ghirardelli Chocolate Festival. Call it destiny! 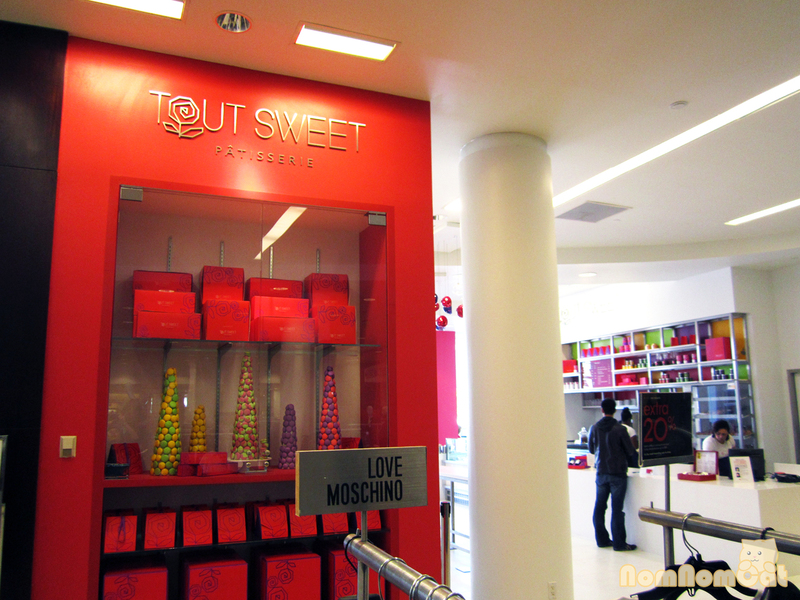 Tout Sweet Patisserie is situated on the third floor of the Macys in Union Square and is just the most adorable storefront. Cute IKEA-fied cafe area, beautiful display of plated desserts, piles of pastries, colorful rows of macarons, and of course, very friendly staff working behind the counter. This photo does not do justice to the alluring display. We wanted to try everything but ended up with 5. It was our first stop of the day, so what follows was technically… the breakfast of champions. 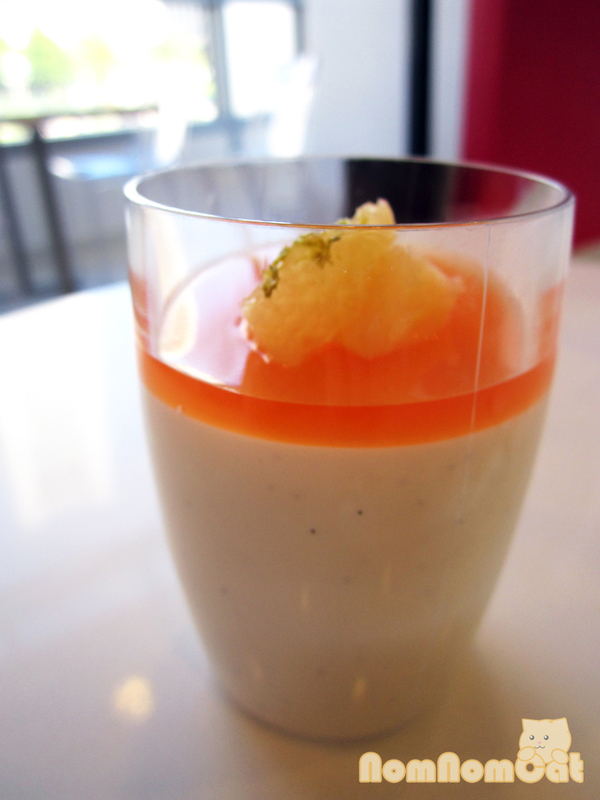 The one that stood out to me was the Florence — a citrus vanilla panna cotta topped with a grapefruit Campari gelee. It turned out to be Martin’s favorite – so much so that we ordered a second one before we left! The panna cotta was creamy and not too sweet, and the gelée added a slightly bitter note. Wonderful flavor profile! 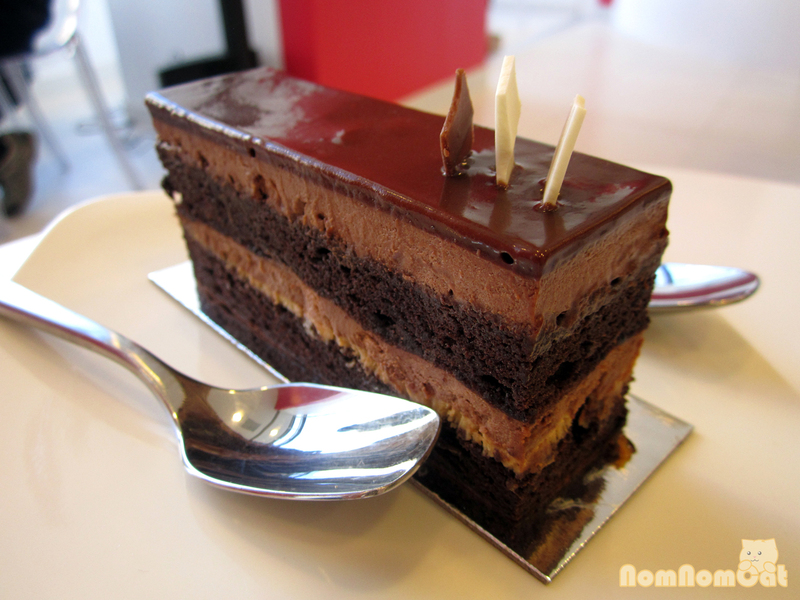 We also got a slice of their namesake cake – the Petit Tout Sweet, a flourless chocolate cake layered with chocolate mousse and topped with a dark chocolate glaze. The layers were decadent and light at the same time, and the glaze… oh the glaze… It had a uniquely velvety texture and we both agreed it was our favorite part of the cake. Martin inquired the girl behind the counter about whether they had a basic chocolate chip cookie. 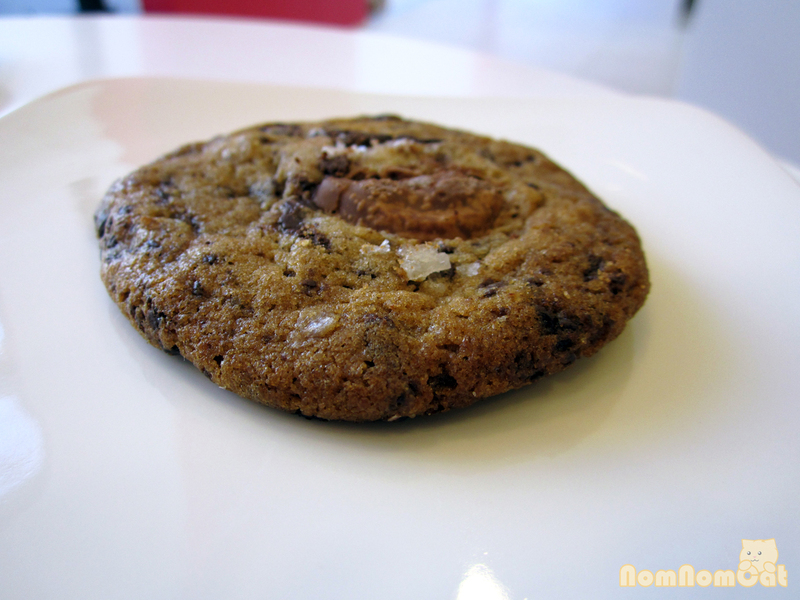 If that’s your thing, try the one here at Tout Sweet — it’s topped with fleur de sel and has generous chunks of quality chocolate. Our only regret was not asking for it warmed up so we could enjoy that fresh-out-of-the-oven experience. Very pleased with our first round of selections and not yet ready to leave, we asked for a suggestion for a light and interesting dessert. 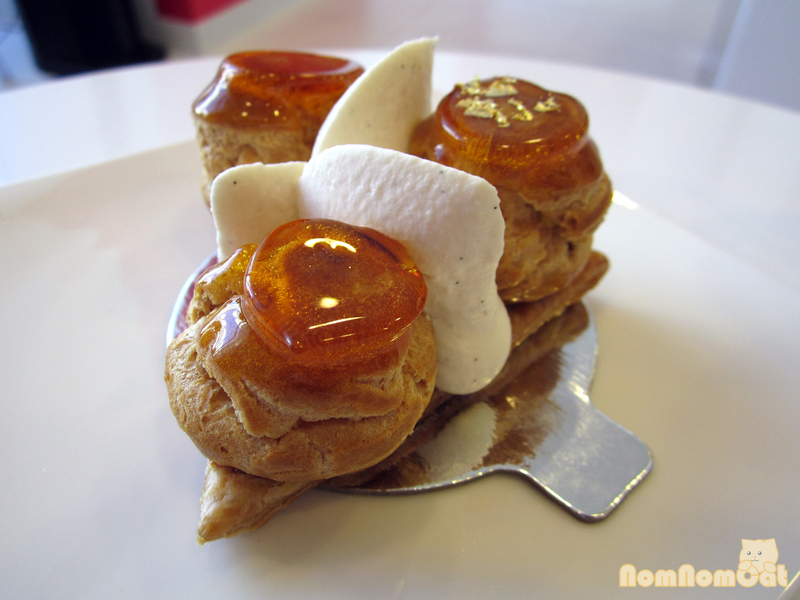 They immediately suggested the St. Honore, essentially a cluster of three profiteroles sitting atop a triangle of puff pastry, dipped in hardened caramel filled with vanilla custard and served with vanilla Chantilly creme. We were given very good advice also – don’t be afraid to dive in! Taking a bite of a whole cream puff and its base of phyllo yielded a wonderful crunch enhanced by the crystallized cracking glaze. The gold flakes were an interesting touch but really didn’t add anything in terms of flavor. Our fifth dessert that morning was a second Florence. Yup. It was that good. However, we brought home some very colorful macarons (my favorite was the MeMe – the cookie part was a swirl of hot pink and neon green!). 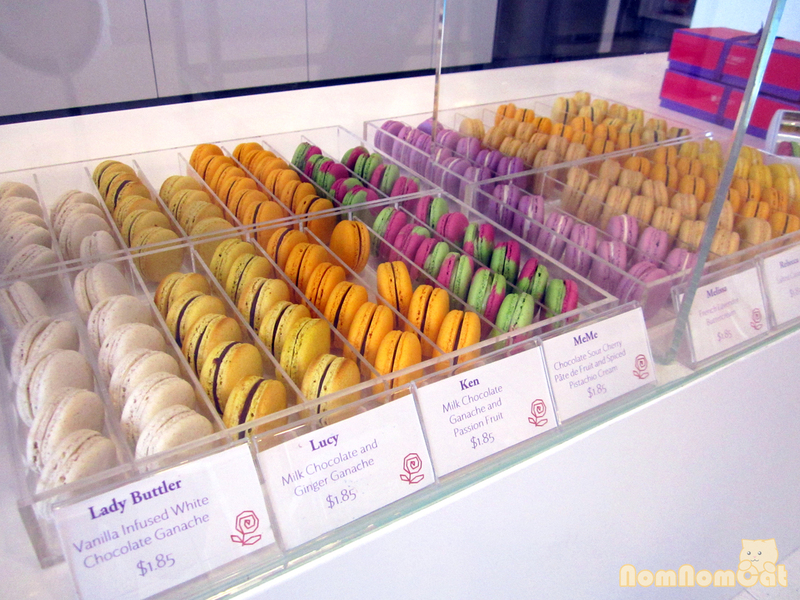 Unfortunately we can’t speak to the flavors of the macarons as we gifted them to our friends and family as souvenirs. 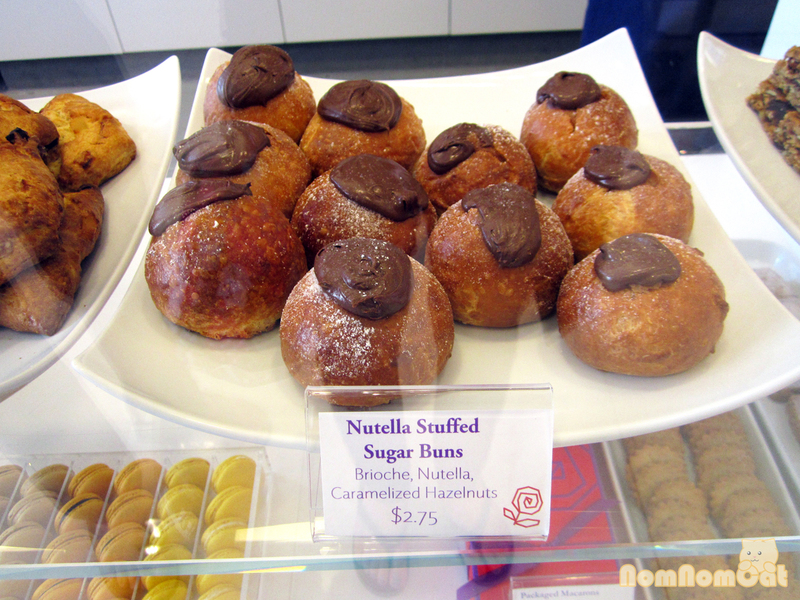 Nutella brioche – I should have gotten more than just one! I also grabbed a lone nutella brioche that had called out to me as soon as we walked in. Despite a long journey being jostled around in my backpack as we trekked up Lombard Street (yes, on foot), it survived the flight back to LA and still tasted delicious! It’s like a chocolate croissant taken to the next level. Plus, it’s adorably round in shape and really, chocolate hazelnut spread makes everything better! We went the second morning after they opened, missing the crowd of media and paparazzi (yay!) as well as the presence of the owner Yigit (boo!). While the prices were a bit steep (especially if you order as much as we did! ), we felt the quality and the flavors were well worth it. Definitely a go-to spot for the next time we return to San Francisco! If you haven’t checked it out yet, please do — they’ve had a month now to iron out the kinks, plus I hear they’ve build upon their menu and now feature savory brunch-y items as well. By the way, take a look at the back of the staff shirts if you see someone turn around :) We had a “you know you’re nerds when…” moment when we were surprised and excited to see sucrose! 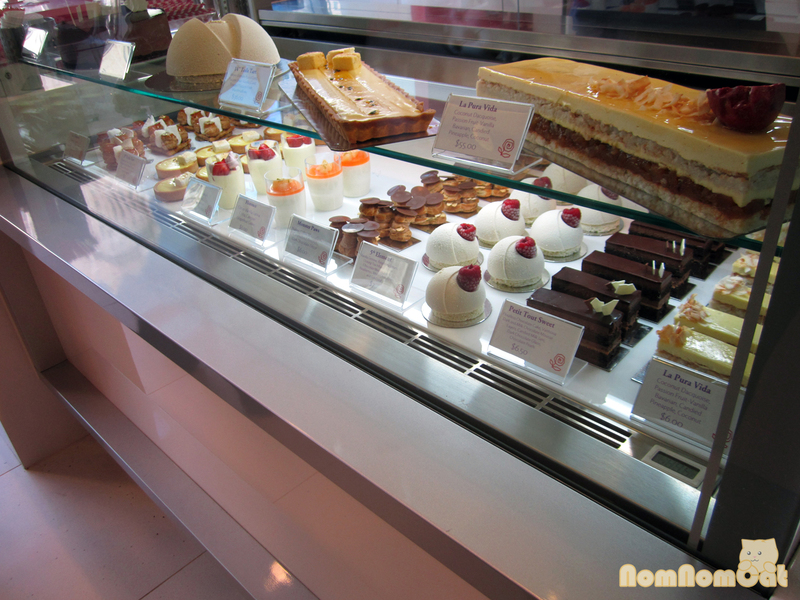 See their Yelp reviews here or follow them on Twitter @toutsweetsf!